Steven Woloshin, MD, MS, Lisa Schwartz, MD, MS, and H. Gilbert Welch, MD, MPH, are general internists, faculty members at Dartmouth Medical School, and researchers in the VA Outcomes Group, Department of Veterans Affairs, White River Junction, Vermont. 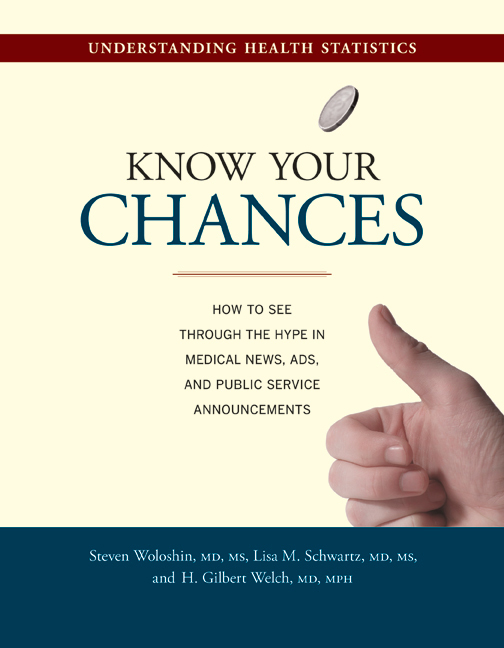 Woloshin and Schwartz have written many articles together for leading medical journals, and Welch is the author of Should I Be Tested for Cancer? Maybe Not and Here's Why (UC Press). PART ONE. WHAT IS MY RISK? PART TWO. CAN I REDUCE MY RISK? PART THREE. DOES RISK REDUCTION HAVE DOWNSIDES? 7. Do the Benefits Outweigh the Downsides? 10. Who's Behind the Numbers?